"Mr. Cernikovsky's 43 Friends of Archaeology"
Tak'alik Ab'aj, December 2012. 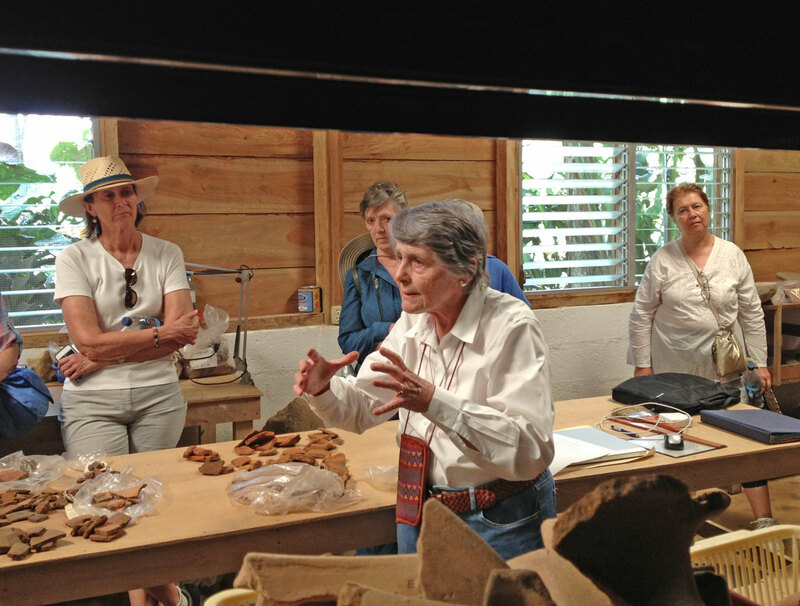 Doctora Marion Popenoe de Hatch, on a tour of her lab. Click to see a large image. Scroll down to see more photos. 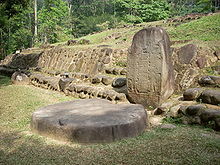 Tak'alik Ab'aj (in K'iche', that means "Piedra Parada" ... "Standing Stone"): A site with sculptures influenced by Olmecs, Izapas and Mayas. Its occupation covers from the Pre-classic Period (800 B.C.) to the Late Classic Period (900 A.D.). The archeological site is divided in three great main groups; two of them have been excavation centers and restoration works (Central Group), settled on a stepped plateau. 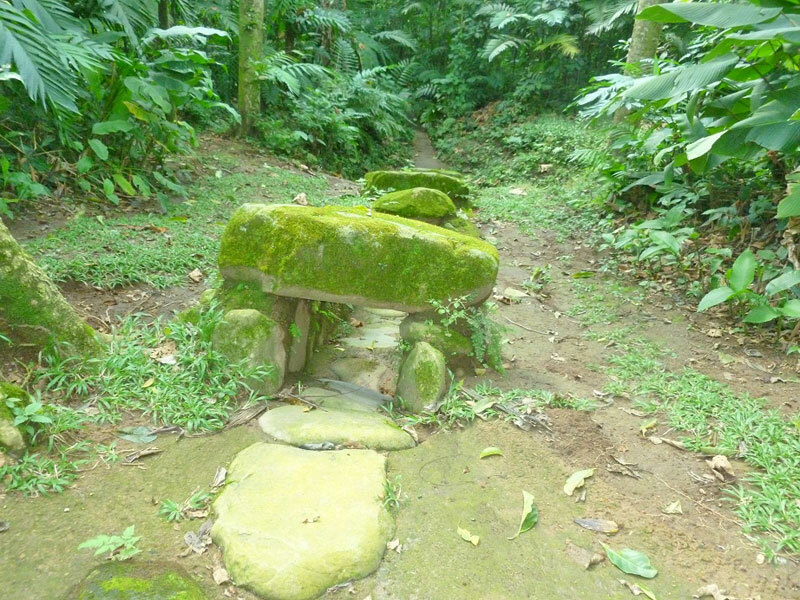 The central group is open to the public and has one of the first dated monuments of the Mayan area, Stela 5, and an example of a vapor bath. During its first occupation (800- 400 B.C.) the site shows links with the Olmec culture and is part of the commercial chain that expands from the Mexican Golf to El Salvador’s coast. 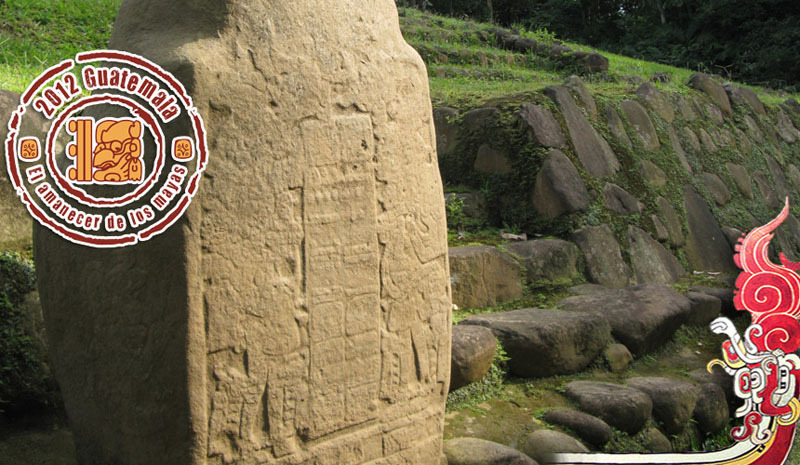 It is the only site in Mesoamerica with clear design features from both Olmec and Maya cultures. Around 400 B.C. 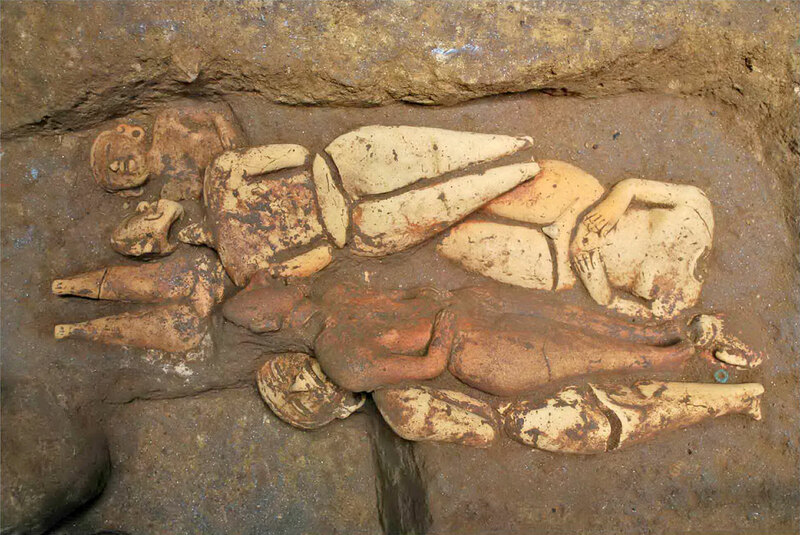 the site is involved with a Mayan tradition linked with the Highlands and that lasted at least to the year 150 A.D. During the Classic Period, its relationships seem to be oriented to Chiapas, being far away from the coast traditions that were on their best moment. During the Early Classic Period some revitalizing movements are seen on the site and the construction comes again to its peak. Finally, during the Post Classic Period, the K’iche advance party took control of the site. Directora de Centro de Investigaciones Arqueológicas y Antropológicas, Directora del Departamento de Arqueología y Titular de la Cátedra Kidder de la Universidad del Valle, Guatemala (UVG). Received a Ph.D. in Anthropology from the University of California, Berkeley. Academic advisor to "Proyecto Nacional Abaj Takalik". Dra. Popenoe has two labs, one at Tak'alik Ab'aj, which you will see during your visit, and another at UVG in Guatemala City, where this photo is from. Afternoon at IRTRA: swimming pools, tennis, a superb minigolf, restaurants and bars. Water Park Xocomil and the theme park with rides, Xetutul. Our rooms were in the Santa Cruz complex. Click for details and photos. 18:30 - Conference room, a welcome to the expedition, and a presentation by Marion Hatch Popenoe about Tak'alik Ab'aj and the Guatemalan project of explorations of the site. See below for links to some of her writing about the site. 06:30 - Sandwich making volunteer party, made 100 sandwiches. 10:00 - two guided groups of 22 each took different routes through the site. One with English translation. 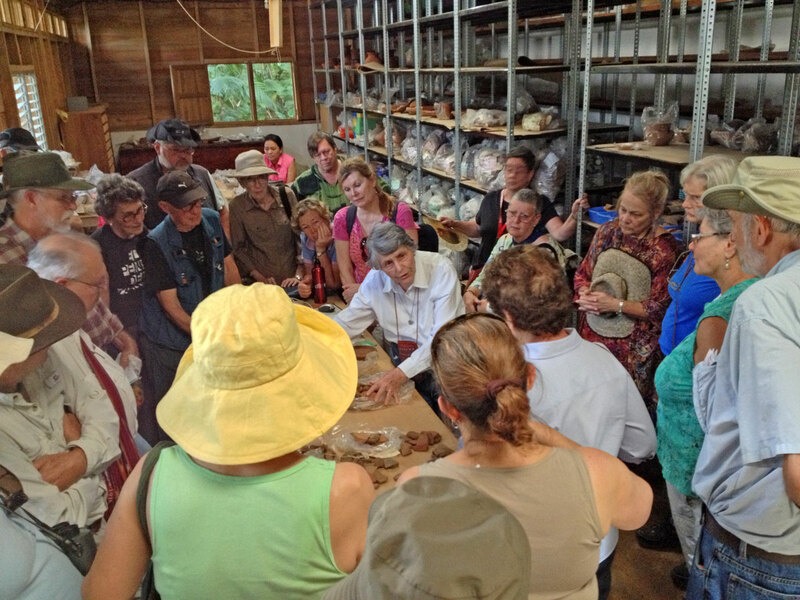 We visited Marion Popenoe's Maya pottery lab! 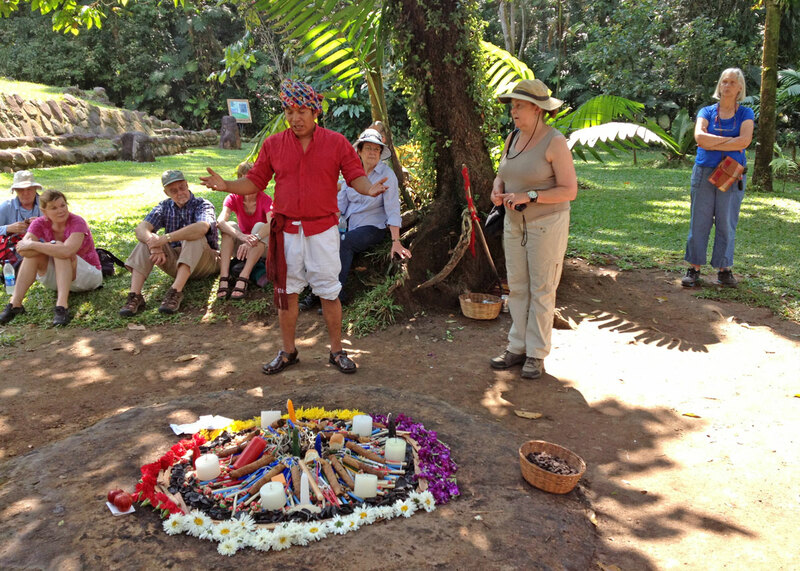 11:45 There was a Maya ceremony going on in front of Stela 5, with our own offerings and "deseos"", wishes. 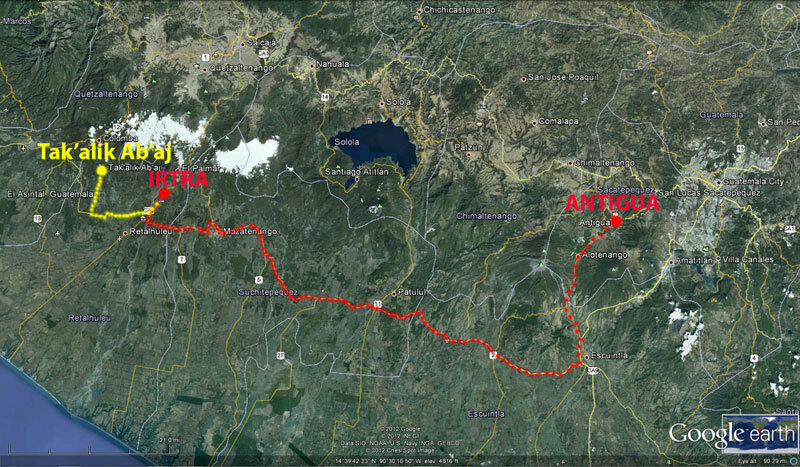 18:00 - 19:00 - buses dropped everyone near their houses in Antigua. Stela 5 and altar. 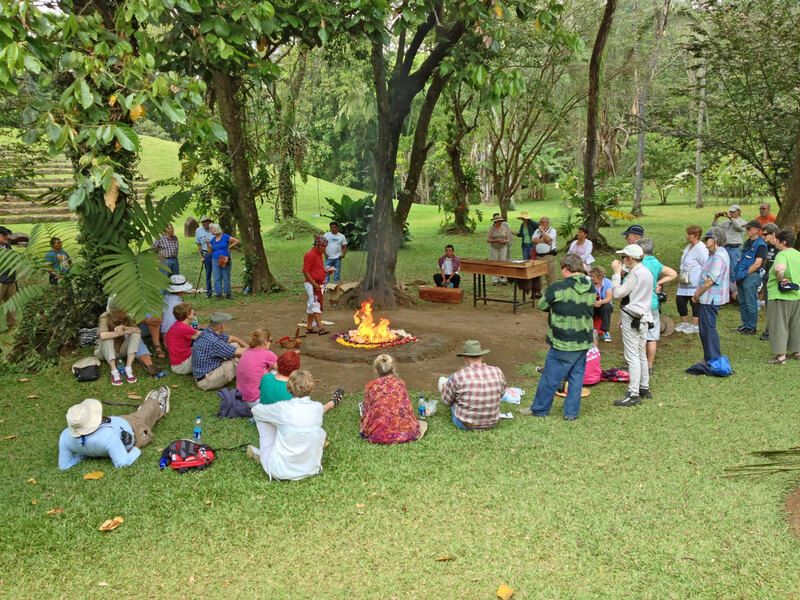 See below for a Maya ceremony after the tour. AMS Radio Carbon dating tests funded by the trip will be done by Beta Analytics in Miami. Christa Schieber de Lavarreda, director of the TA site, writes: "Yes, we expect to be able to run AMS tests (US$ 710 each) for at least three charcoal samples. Charcoal and wood are two of the most widely used materials for accelerator mass spectrometry (AMS) radiocarbon dating. AMS labs prefer to carbon date charcoal and wood because these materials do not need complex pretreatment. 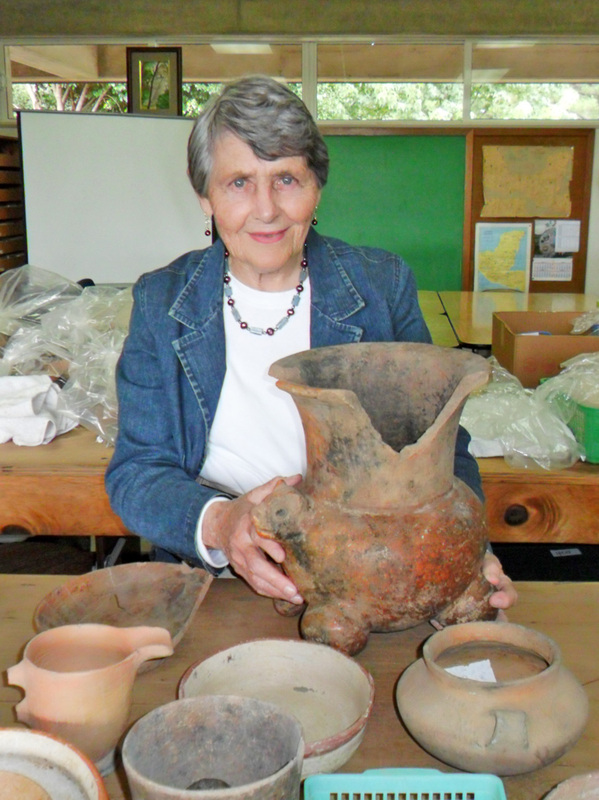 These radiocarbon dates will be of utmost importance to provide a solid confirmation of the ceramic dates provided by Dr. Marion Popenoe de Hatch for the chronologic frame of the archaeological sequence related to the finding’s excavation which is still in progress." Depending on how many people on the trip, we have enough to pay for three tests, maybe even a fourth. After the radio-carbon-dating tests are done, Christa Schieber promised to share results with us! I have authorized Christa Schieber de Lavarreda, the TA site director, to go ahead and send three samples from the "Offering of Las Muñecas" and the "Collar" (Necklace) to Beta Analytics, to be paid from the funds collected by this group! 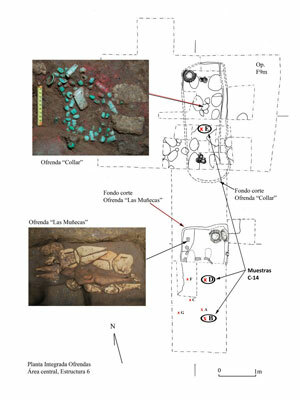 "Las Muñecas" and the "Collar" were recently excavated at Structure 6 at the TA site. "Las Muñecas" are estimated to be from 700 - 400 B.C. 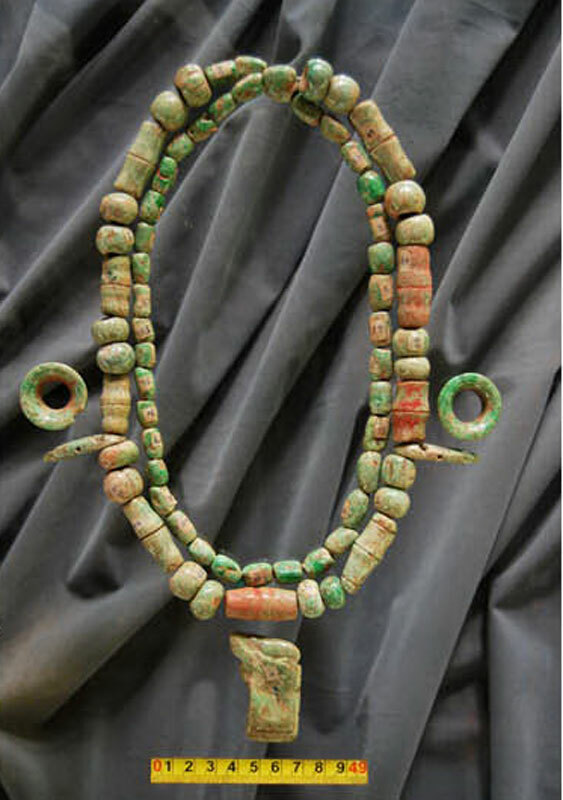 The "Collar" might be from 200 B.C - 150 A.D., both long time spans to estimate. The radio carbon dating tests will give them a more precise reading. How fascinating that such items are being found now, by the active Guatemalan team exploring the site. 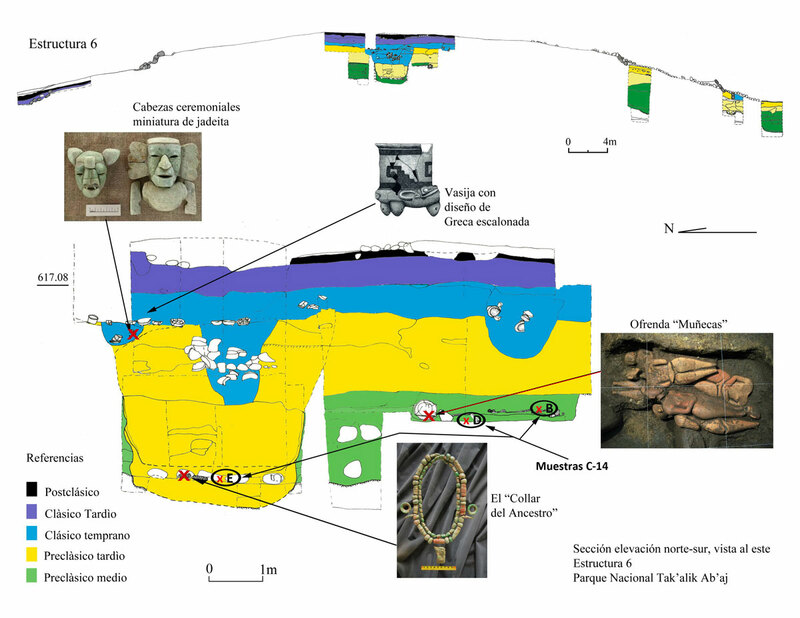 How exciting, this just in, results of the first test, "Las Muñecas", possibly even somewhat older than Marion Popenoe estimated ... the radio carbon test dates them from 770 - 510 B.C. Please remember that construction at Tikal did not start until around 400 - 300 B.C. Press conference by Christa Schieber de Lavarreda at the Palacio de la Cultura in Guatemala City: The oldest Maya royal tomb yet found in Mesoamerica: 2,500 years old, making Tak'alik Ab'aj "cradle of Maya culture". Click here to read the story in Guatemala Times online ... this quotes Christa Schieber and acknowledges "Mr Cernikovsky's 40 friends of archaeology" for funding the radio carbon dating test that confirmed Marion Popenoe's analysis and dates. Click here to read the story in Prensa Libre and a BBC report (click on the image to run the video report). All of them credit OUR carbon dating test as proof! 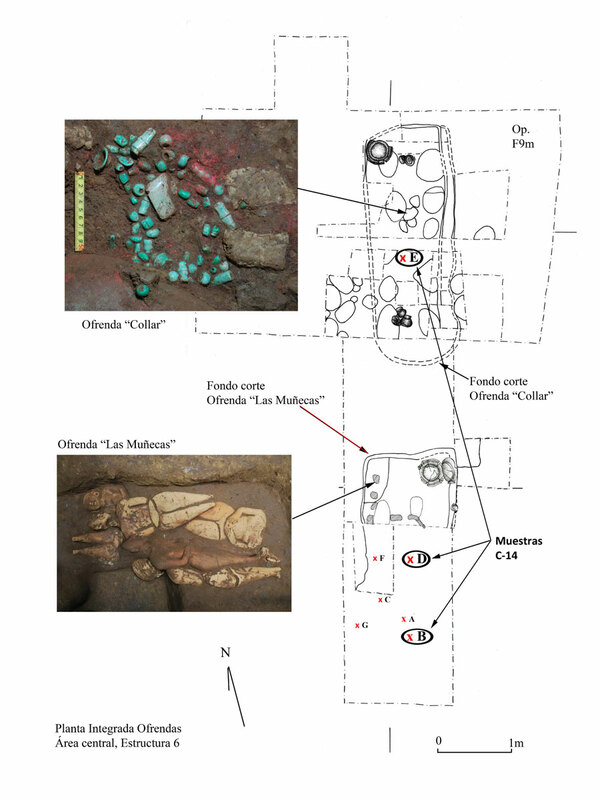 Below are two illustrations of the dig, which indicate where "Las Muñecas" and the "Collar" were found, and approximately the period from which they date. 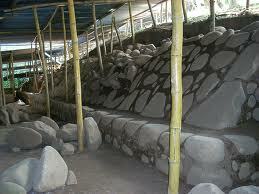 For our last "amateur archaeologist" trip, with 20 people to El Mirador, in January 2011, please click here. If you would like to contribute to the Universidad del Valle Archaeology Department ... they need money for scholarships ... please click here. Tak'alik Ab'aj, December 2012. Doctora Marion Popenoe de Hatch, making a point during a visit by our group to her lab. Click to see a large image. Powerpoint presentation by Doctora Marion Popenoe de Hatch on December 6 about Tak'alik Ab'aj, made at IRTRA. This is a large (24 MB) file and will take a while to download. I will try and convert it into an online document. Tak'alik Ab'aj, December 2012. A Maya ceremony was going on ... Click to see a large image. Tak'alik Ab'aj, December 2012. A Maya ceremony in front of Stela 5 ... Click to see a large image. Tak'alik Ab'aj, December 2012. David Dean photo. This page was last updated on 02/18/13.